“A wealth of scientific and anecdotal evidence demonstrates precisely that it’s when people have surpassed many of life’s big landmarks that their overall satisfaction and happiness peaks,” according to a recent Huffington Post article¹. The article goes on to say that most adults experience two peaks in happiness during their lifetime, one during their 20’s and another around the age of 69. We all know that happiness is a state of mind, but it is one that we are oftentimes able to control. This interesting study found that overall happiness tends to be lower in our younger years – usually due to stress associated with work, busy lives, emotional turmoil and financial instability. However, there’s reason to hold on to hope because happiness tends to increase during the later years in life, especially in our 60s. Generally, because of their many life experiences, senior citizens have learned to handle life circumstances with better problem solving skills and overall acceptance, regardless of the outcome. Older people also tend to manage their emotions better, not getting as angry or upset when difficulties arise, as long as they’re not suffering from a cognitive condition requiring assistance from an in-home Dementia Care Clearwater. I think we can all agree that our view of what we find to be satisfying and fulfilling shifts later in life, adding to our overall level of contentment. For this reason, getting older doesn’t have to be something we dread; in fact, the future looks brighter as we age, especially when aging adults in Florida have occasional help from an hourly caregiver in Clearwater. 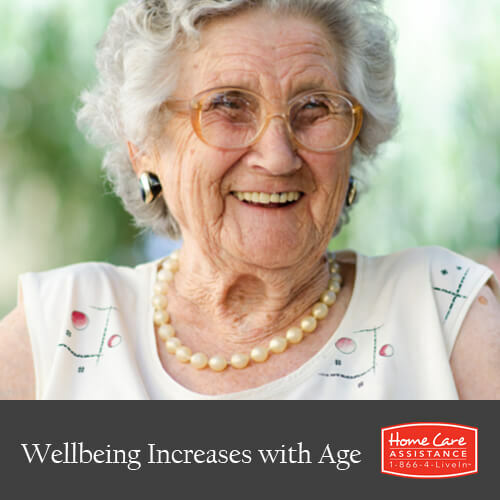 If you or an aging loved one could use some in-home assistance to help further enhance quality of life and overall well-being and happiness, turn to the trusted professionals at Home Care assistance of Tampa Bay. For more information on our 24/7 or hourly senior care plans, or to schedule a complementary consultation, please call 727-330-7862. ² “With Age Comes Happiness: Study Suggests Older Adults Have Better Emotional Control.” Association for Psychological Science RSS.